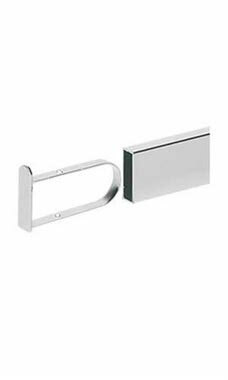 Chrome Flush End Cap for 1/2'' x 1 1/2" Dimensional Hangrail will give your dimensional hangrail display a finished clean look. Use the end cap on any section of hangrail that will be exposed on your display. The end caps can also be used to keep the merchandise from sliding off of the ends of the hangrail while customers are browsing for merchandise. The end caps are easy to install by placing the cap into the open end of the existing hangrail and secure.